THE IJPC JOURNAL is an online peer review journal now accepting manuscripts. The Image of the Journalist in Popular Culture Journal is an online academic journal that adheres to the highest standards of peer review. 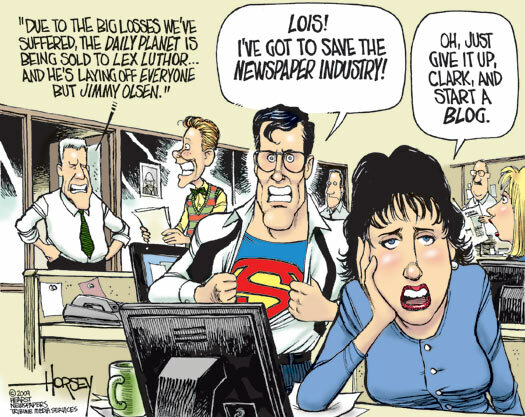 Its purpose is to further the mission of the Image of the Journalist in Popular Culture Project to investigate and analyze, through research and publication, the conflicting images of journalists in every aspect of popular culture, from film, television, radio, fiction, commercials, cartoons, comic books to music, art, humor and video games – demonstrating their impact on the public’s perception of journalists. The Image of the Journalist in Popular Culture (IJPC) Database with more than 90,000 items on journalists, public relations practitioners and media in films, television, radio, fiction, commercials and cartoons. 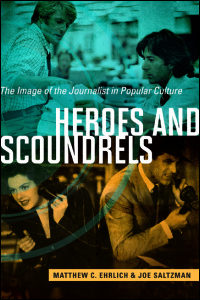 Heroes and Scoundrels: The Image of the Journalist in Popular Culture by Matthew C. Ehrlich, professor of journalism at the University of Illinois at Urbana-Champaign and Joe Saltzman, professor of journalism at the University of Southern California. Publication date: April, 2015. University of Illinois Press. Check out the Heroes and Scoundrels Website, whichl features chapter summaries, updates and new material. A companion 40-hour video for use ONLY in the classroom and for additional research is also available. You have to be a member of the IJPC Associates to get the video -- but if you show proof of purchase of the book, the IJPC Associate membership fee will be $35 instead of the regular $50. IJPC Student Research Papers featuring student research papers on the image of the journalist in popular culture. Resources. Use of http://www.ijpc.org to share research materials with the public and academic community. Includes Recommended Books, Articles and Web Sites, IJPC News, The Image of the Gay Journalist in Popular Culture and Sob Sisters: The Image of the Female Journalist in Popular Culture, which includes an introductory essay and a bibliography from 1700 to 2006 with listings for more than 8,500 films, television and radio programs, novels and short stories, plays, poetry, cartoons and comics, commercials, art and songs. Publication of books, periodicals, monographs, and articles. The first publication, Frank Capra and the Image of the Journalist in American Film, by Joe Saltzman, is available for purchase through Amazon. The IJPC Archive of more than 30,000 films and telvision programs, MP3 files and audio tapes (more than 5,000 hours of radio programs) and various scripts, books, more than 8,500 novels, short stories, plays, poetry, research materials, articles, and other artifacts. IJPC Class Materials to help you create your own class as well as The Image of the Journalist in Popular Culture class, a 200-page syllabus featuring 28 two-hour plus IJPC documentaries showing the image of the journalist in film and television from 1919 to 1990. Also lesson plans for the The Image of the Public Relations Practitioner in Movies and Television, 1901-2011, The Image of the Broadcast Journalist in Movies and Television, 1937-2006, The Image of the War Correspondent in Movies and Television, 1931-2007, and The Image of the Gay Journalist in Movies and Television, 1929-2009. Symposia, exhibits, conferences, classes, and video-audio festivals documenting the image of the journalist in popular culture. Research documenting the public perception of journalists and the journalists' perception of journalists in both fiction and nonfiction media.